When the Bold Metals Collection was released, Real Techniques took on a whole new look. 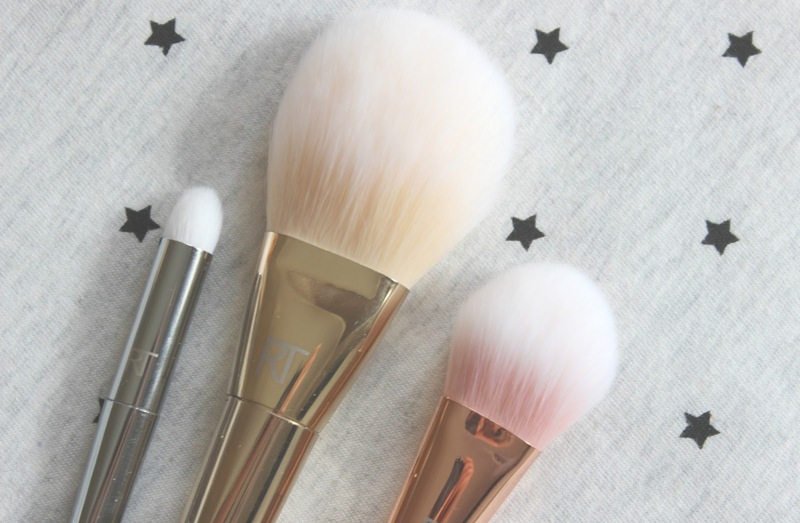 Adding a more chic and high-end touch to a high-street brand, it was that something-something I'd been looking for from a brand whose brushes are affordable with the quality of high-end alternatives. I'm a sucker for the original Real Techniques brushes, the design and coordinating colours for different uses, but this was something else, something special. Bold Metals was the stand out collection I'd be hoping for! 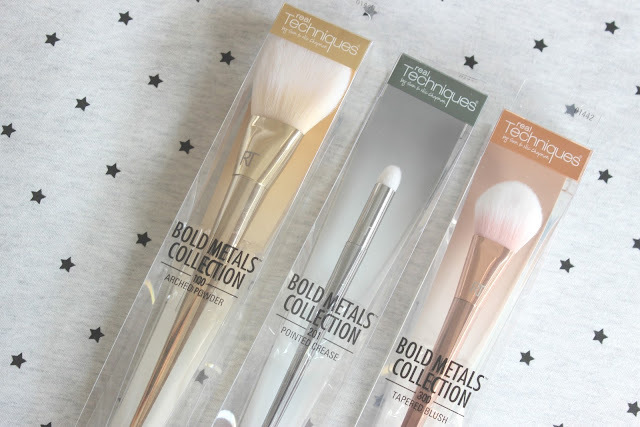 The idea behind the Bold Metals Collection was to provide Real Techniques fans old and new with a brush collection that had the luxury look and feel of a premium brush line, at a more affordable price than the high-end brands out of many beauty budgets. Whereas this range is slightly pricier than the original Real Techniques brushes and sets, it's a good in-between for those who can afford to spend a little bit more but don't want to be splashing the cash on unaffordable professional brushes. The collection features three colour themes, just like the original brush line, each corresponding to a specific area or beauty task. The gold range covers bases whilst silver brushes are for eyes and finishing is sorted with some on-trend rose gold offerings. There's a good selection of brushes available, so you have a brush for any task; blush, bronze and powder, shadow, crease and liner brushes, everything you'd need features in this bold collection. Each of the brushes features refined artistry cuts, weighted handles and super soft bristles to ensure ease of use, being able to use the brushes with a variety of product formulas and providing a flawless finish no matter your expertise. The Arched Powder Brush features a sleek gold handle and is on the larger side of powder brushes I've tried in the past. It features a lovely round arched cut top and has been designed to work best with pressed or loose powders, so I tend to use it for setting powders and an all-over golden glow with a subtle bronzer. The Tapered Blush Brush is a rose gold beauty and as the name gives away, has been designed for use with blusher - but I also love this one for sweeping highlight across the top of my cheekbones and the ever-so-slightly tapered top means this one even doubles up nicely as a great contour brush. Last but not least, the Pointed Crease Brush, a fantastic alternative to high-end eye brushes. It's great for blending shadows through the crease but what I love to use this brush for the most is adding a subtle eye-opener shade in the inner corner, or blending a deeper shade through the crease for a cut-crease look. Have you tried the Bold Metals Collection yet? Just one of many new products available from Real Techniques, I'll be adding the Brush Cleansing Palette to my wishlist next! Available in-store and online, you can check out the Bold Metals Collection at www.boots.com. This collection really is stunning, though I'm still yet to pick any of them up! I have been lusting over these for ages, I love the m core collection, they are some of my favourite brushes!